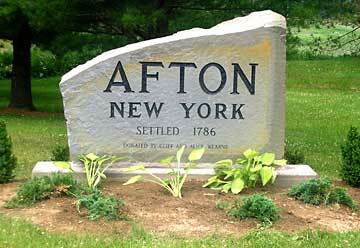 Afton, established 1892 - settled 1786, is located in Chenango County along the Susquehanna River. It lies equidistant between the cities of Oneonta and Binghamton along the Interstate 88 corridor. The latitude of Afton is 42.228N, and the longitude is -75.526W. The elevation is 1,001 feet. The name Afton came from the Scottish poem, "Afton Water" by Robert Burns, and was suggested by Joseph Bennett Chafee. Afton proudly features a great school, public library, Community Center, youth sports organization, supportive community groups like the Afton Sertoma Club, and the Afton VFW. Anchoring the village are several churches, a resident health center, a golf course, a full compliment of stores and restaurants, as well as proximity to state and county parks. A visitor to this Central New York town, can find a museum, green spaces and many attractions in all seasons. The Afton Golf Course is one of the earliest in the area to open and brings many players to Afton. With its rich history, Afton has a thriving Historical Society, chartered in 1986, with a Museum offering many interesting and educational exhibits and programs. Site-seers often wish to visit the famous Mormon House and the old Universalist Church building built in 1819. (The Mormon House is where the Mormon Church founder, Joseph Smith and Emma Hale were married in 1827.) The Afton Free Library, founded in 1933, has very attractive space in the Jack Bolster Community Center, which also houses the Village of Afton offices and the Susquehanna Room for public meetings. Foster Park is a welcome location to picnic, read a book or simply enjoy the outdoors in peaceful, beautiful surroundings. Summer brings lots of outdoor activities like Little League games at Davey's Field and weekly stock car races held at the Afton fairgrounds. The greatly anticipated Afton Fair in July and the Arts and Crafts Show in August are its biggest events drawing many visitors. With a population of 836, the village is home to several growing production and service industries. On the spiritual side, there are seven churches in the town: two Methodist, a Baptist, Presbyterian, Episcopal, Roman Catholic and a Christian Assembly. Afton Lake, which was formerly a resort area, is now surrounded by private homes whose members belong to the Afton Lake Association. Central to the whole community is the school, the biggest employer in Afton. The original brick building was constructed in 1908, but has been expanded by successive additions. Today the Afton Central School is top-notch with all the modern amenities, a large faculty, and a fleet of school buses to transport students. Afton is mainly a charming community with traditional values. It has attractive and well-maintained homes with neighbors who value the landscape and the fine opportunities for raising a family and putting down roots, something visitors often fall in love with.